I have to say that I had seen quite a few different reviews for this book and wasn't sure if I wanted to read it. But then I got a hold of a little before snippet that Paulson posted and I loved it. So I had to pick this one up and give it a try! I absolutely LOVE this cover. It is GORGEOUS! The imagery is amazing and I think perfect for what the book turns out to be about! Elsa, I really liked her. She was tough and snarky, one of my favorite combinations in leading female YA characters. I hate the swoon annoying ones, and she was having none of that, at least not at first. At first she's a bit shy and introverted, but as she comes into herself she realizes she is so much more. It's great to watch her grow and change throughout the book. Tuck, well, holy moly. This guy had me at the excerpt on Paulson's blog. I mean he was totally swoon worthy in that clip: standing up for his best friend's sister. It was brave and unselfish. She in this book he's just the same. He's a bit arrogant at first, but then he just kind of grows on you. You want him to be the winner, you want him to come out ahead! Graham was a great big brother, although perhaps a little too protective. Actually, kind of to the point of annoying. Didn't want anyone or anything near his sister, no matter what. A bit smothering, but always coming from the heart. He needed to be put in his place a bit, but overall I liked him in the end. Astrid, wow, what a, well, I want to use a bad word but then I don't. She has some good intentions, but she is pretty much bad a$$ throughout the book. But she's just evil in my opinion and no matter what I could not trust her at all during the course of the book. As for the plot, it was interesting. I am a fan of Norse mythology and really have been trying to learn a bit more about it. I liked how they incorporated the Valkyries into this book. 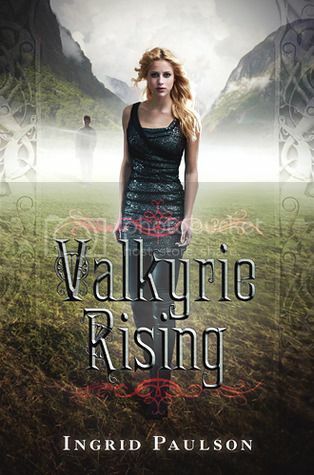 Paulson gave an adequate background as far as the history of the valkyries. I have to say that I could have seen a bit more world building in this book. The author chose to use the back drop of Norway, I have never been there, but I still can't picture it in my mind. I really wanted to see what it looked like, too. The romance kind of took a back drop to the other setting, which wasn't necessarily a bad thing, but I would have liked to see a little more of it to keep my interest in the budding relationship. The writing in this book was just ok for me. It doesn't stand out amongst any of the other YA books I have read. The author did move the book along at a quick enough pace for me. And I could have used a bit more action. It kind of just floundered on that. Although the author did try to work it in. It wasn't delivered with the bang I really needed. The author did through in some unpredictability, which was nice. But then there were other parts where I just knew what to expect. I needed something a bit more unique. Overall, this was a fun book, enjoyable enough but nothing particularly special. The ending was a tidy wrap up, but now I see that it's a series, so I'm interested to know where the author is going to take it from here.